Normally I think Broadway song-and-dance musicals are fun but I rarely find myself enthralled with a production as a whole. If the dancers are strong, often the voices are inconsistent.... if the voices are appealing, sometimes the dance routines seem stale or more energy than synergy. 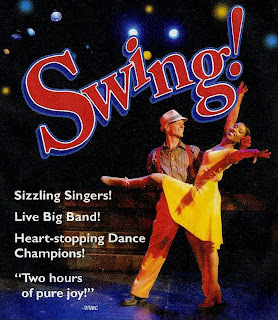 It was “press night” at Chanhassen, offering an opportunity to return (after an embarrassingly long absence) to one of America’s premiere dinner theaters to see an opening-week production of Swing! With songs from the pens of Goodman, Ellington and other masters of the era, a live band conducted by local master George Maurer, and choreography courtesy of veterans of the New York production, it seemed like a pleasant way to spend a Friday evening. It was not pleasant. It was near perfect. The last time I saw such energetic and razor sharp synergy on the dance floor was a long-ago performance by Chicago’s famed Hubbard Street Dance Company. “Swing” was redefined as the dancers, led by elastic choreographer/dance captain Alison Solomon, were literally airborne, twisting, turning, catapulting, sliding....English vocabulary has inadequate descriptors for their simultaneous velocity and finesse. There was consistency across vignettes, but the musical highlight of the show, for me, was the animated, whimsical, clever duet between young vocalist Erin Marie Capello and veteran trombonist John England on “Cry Me a River.” A comical, crying trombone and a sassy, satirical take on lyrics that are often delivered as self-pitying or bitter combined with just enough gusto, just enough pathos to mesmerize. And you had to see it to hear it. Chanhassen has mastered the difficult art of merging fine dining with high-class theater without compromising either. The kitchen delivers a surprisingly high quality menu with impeccable service for a large crowd on a tight timetable. Like the cast of Swing!, the kitchen crew follows finely crafted choreography.